I recently went to Sephora looking for a nail polish to wear to a wedding I’m going to when one of the girls who work there asked me if I was interested in trying out the new PerfumeIQ to find myself a new scent. She mentioned they were giving a free sample of whatever scent I wanted so I decided I’d go for it. Their PerfumeIQ is pretty much the exact same thing as their SkinIQ. Simple, short and accurate. I got my usual floral scents in my results but I was getting bored of those and wanted something different. She asked me if there was something summery that I enjoyed and I had mentioned Bobbi Brown’s fragrance “Beach” but knew it didn’t last very long and wanted something that would work. Lucky for me, Maison Margiela has recently come out with a whole line of perfumes and my beachy scent was one of them. Along with this scent, there are many more for not only women, but also for men. Each scent is representative of a certain memory and the label contains the name, a place and location, fragrance description and style description (male or female). 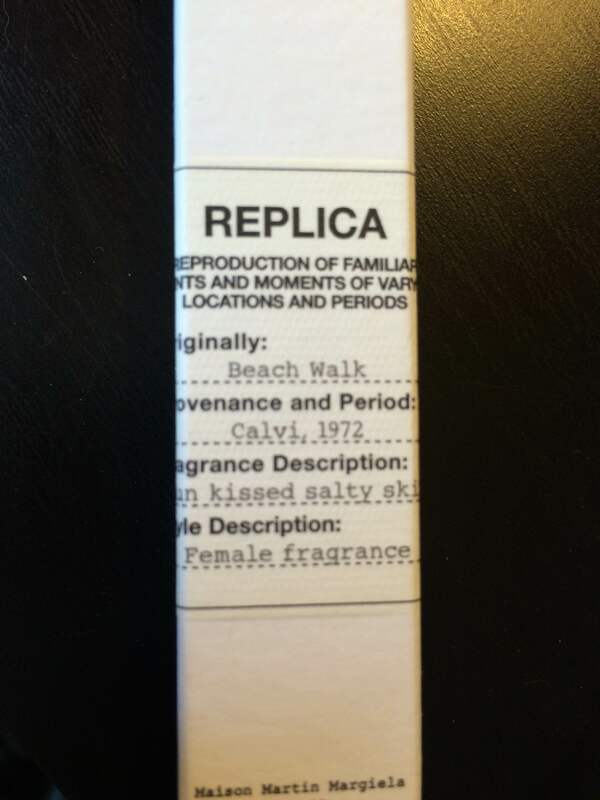 This specific perfume is called ‘Beach Walk’. I bought the roller version (0.34oz) which you can find here for C$30 or the full size bottle (3.4oz – on the same link; picture above) for $115. Personally, if I had the financial stability to buy the bottle, I would have. This scent is honestly one of the best I have ever smelt. It is deep and rich and it lasts all day long. I work at a coffee shop where the smell really overpowers any scent I’ve ever worn to work and this one outlasted it. I went to the gym right afterwards as well and it still outlasted that. I wore it for over 12 hours and the scent never faded away. This scent contains bergamot, coconut milk, lemon, pink pepper and musk. According to Sephora, each label on the bottles is 100% cotton and resembles the tags used on clothing and accessories for the ‘REPLICA’ couture collection at Maison Margiela. I love the SkinIQ! I will deff have to try out the Perfume IQ! I am obsessed and dropped the $125 USD on a full sized bottle after using the sample!